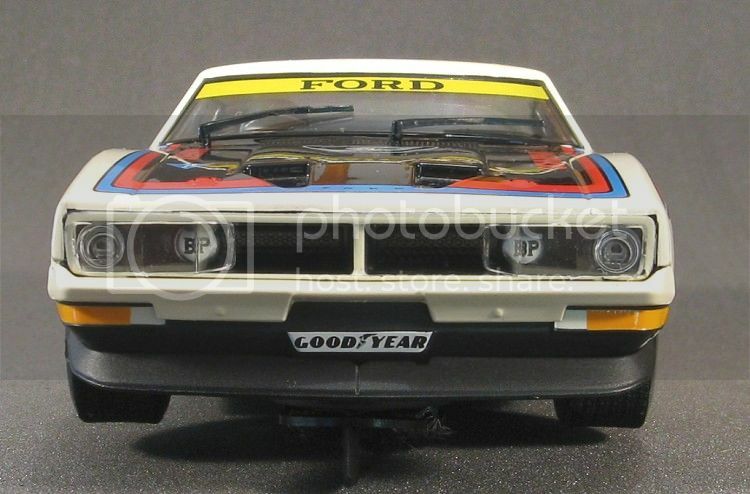 The 1976 Bathurst event was probably one of the more controversial....after the event. Not only was it a close run race with excitement aplenty on the closing laps as one of the cars in contention dropped out, A pit stop put the next contender some way behind the leader and then the Morris – Fitzpatrick Torana developed engine problems while in the lead on the closing laps; and with a couple of laps to go the Torana smoking heavily was nursed to the end of the race with Colin Bond close on his heals. At the time it was thought that there had been a lap counting era and bond and Brock had lost a lap each. Holden declined to lodge an appeal and the results stood. Some years later at a testimonial dinner, Holden apologised to Harvey for not appealing, Mmmmmm? 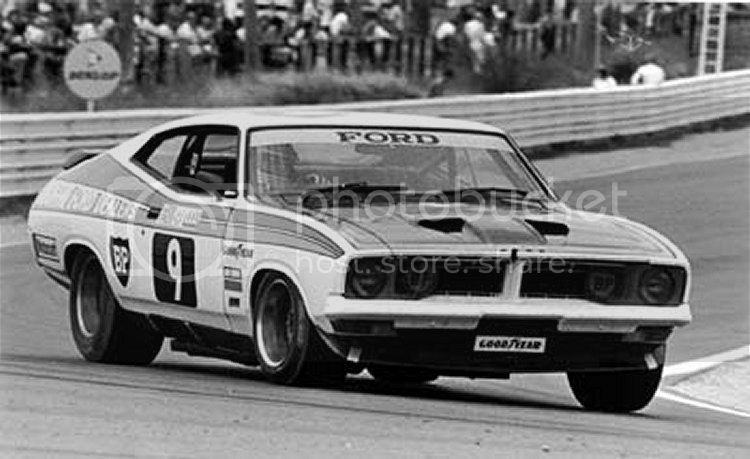 The Falcon of Moffat and Enduro champion Vern Schuppan was sponsored by the Ford Dealer network. 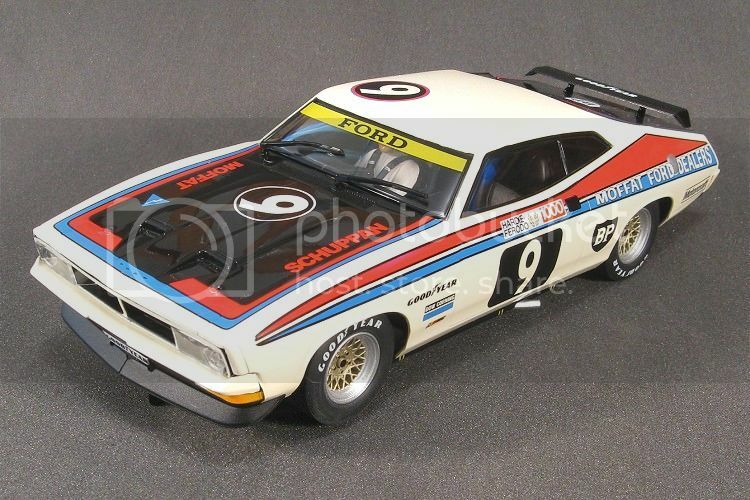 The dealer team Falcon entered the Bathurst 1000 as part of the 1976 Australian Touring car championship and the team got off to a good start with Allan taking pole after qualifying. Allan blitzed the start of the race closely followed by Bond, Negus and Morris. He kept the car out front lap after lap until Brock took the lead after Moffat pitted on lap 42 and handed over to co-driver Vern Schuppan. Brock momentarily stopped, thinking he had a broken throttle linkage. Schuppan took the initiative and went into the lead on lap 66 ahead of Bond, Gardner and Fitzpatrick. Schuppan then had to pit on Lap 74 to have the bonnet fixed. When he next came into the pits for a scheduled stop he handed the Falcon back Allan, they were still in the lead. But lady luck was soon to desert them. The crankshaft pulley broke and the Falcon’s engine overheated and expired. It was towards the end of the season and all the hard work was done. 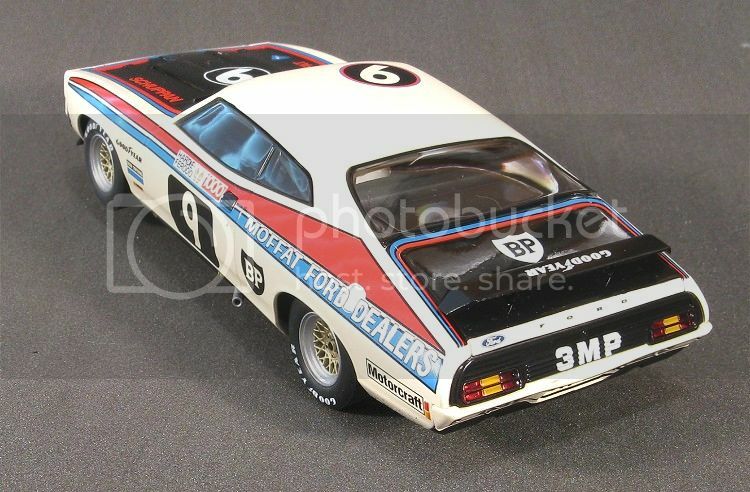 Allan Moffat comfortably had the Championship in his pocket with one round still to go. So hopefully the model will live up to its big brothers counterpart and be a sought after model. If the overseas sales are anything to go buy, almost every slotracer in Aus had it before it hit our shores, which must be a big disappointment for local retailers. 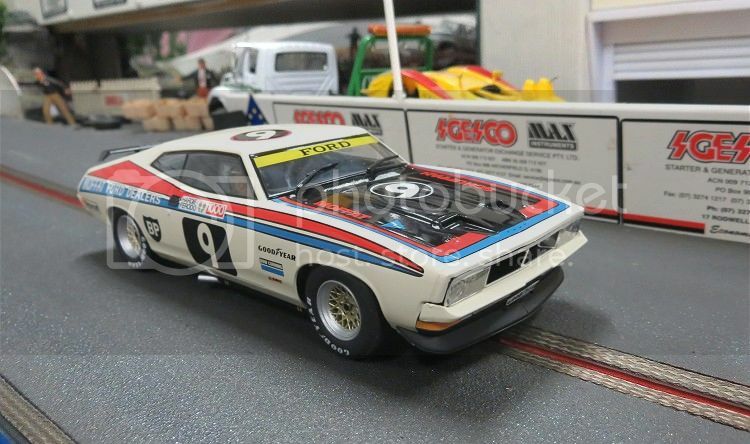 After all, this is not a limited edition and no doubt Mr Scalextric will be releasing its successors sometime in the future, much like they did with the Torana! 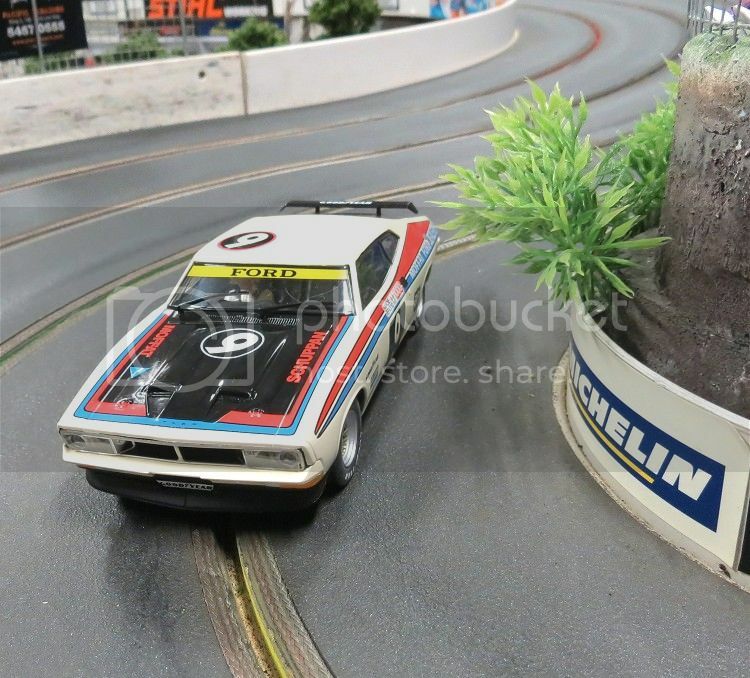 As always with Scalextric , the finish is very good. The body colour is a kind of ivory and not a true white, and the tampo is first class. 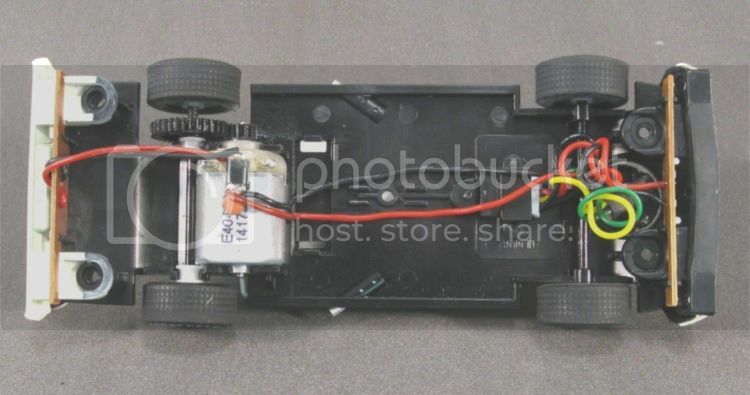 The model has lights front and rear, and the front light assembly has been moulded well. On closer inspection the car’s acrylic headlamp protectors have been modeled too which is a nice touch. But they did cut the corners with the flasher lenses at the front, and all we get there is a bit of orange paint on the body!Also like previous models, the model is clipped together with almost no sign of the heat welds that almost all other manufacturers use. The driver looks a little low but his head is touching the clear bits inside so I expect they didn’t have much choice as far as positioning was concerned. The only bit of detail missing looks to be the door mirrors but this is possibly a blessing in disguise as these are usually the first things to go! Visible inside are the usual delights but Scaley have backed away from a detailed dash and interior with almost everything, including the roll cage finished in black. Wheels and tyres are attractive but both are going to be an issue. The wheels are almost all eccentric and also have a little wobble when they turn; and where they were attached to the sprue during moulding there is a little nib protruding which must affect the tyre seating. To add to that, once fitted, all tyres seem to be very concave on the wheels. To me it looks a little like the rim outer diameters are either too big or the centre diameter is too small. On measuring the rims there is a discrepancy between the inner and outer diameters with the inside being 12.79 m.m. and the outside being 13.13 m.m.? This would account for why the tyres seem to be larger on the outside edges and why there is the necessity to sand off a lot of rubber before the tread area is flat. Either way, if you intend to race this model you will need to do some serious work on the wheels and tyres to get them true. 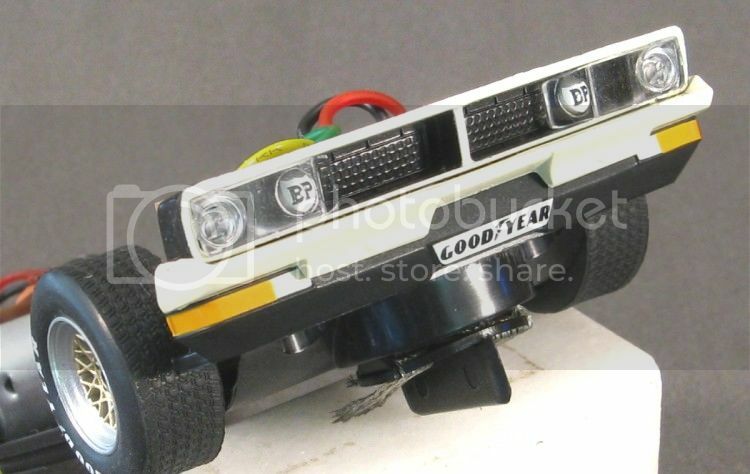 There are only four body screws, and when I say only, I mean the body doesn’t have the two little countersunk screws which normally lock the chassis and drivers tray together; and the front spoiler and valance, as well as the rear light lens panel are all slipped over the front and rear screw mounts and locked in with the same. No doubt if you like to race with screws loose these parts look like they will also be loose! 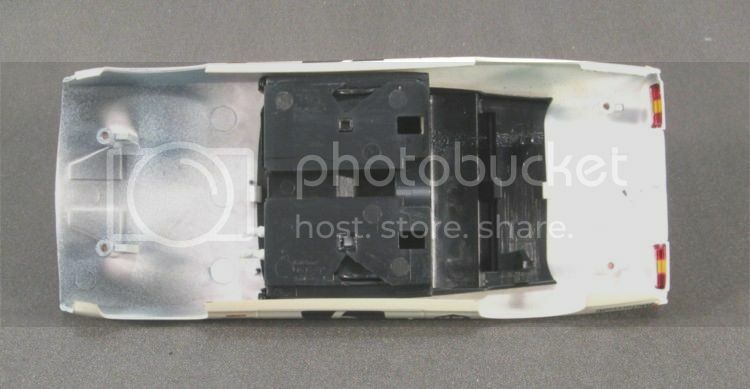 The model out of the box came with the traction magnet in the rear axle position. Again not a big deal but for most magnet situations it would be best suited in the position in front of the motor. Axles are also as we are used to and the font has a little slop up and down whereas the rear is reasonably tight. The motor too is very tight and there will be no need to fret over it working loose at any time soon. And the gearing is the old faithful! Scaley have faltered a bit with the power train. The motor is most definitely off set to one side, and given the space available in this huge model it didn’t, in my view, need to be. Big deal? perhaps not, I’ve seen worse in other models. 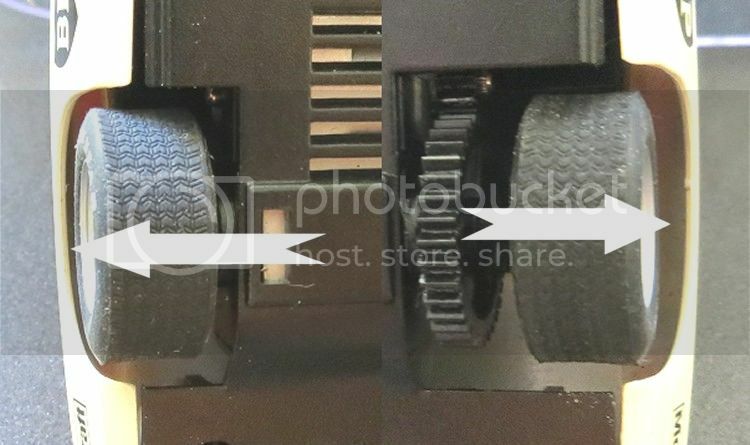 But not only is the motor to one side, Scaley supply the model with the magnet in the rear position, also not a big deal as there is a forward location for the magnet. But this is also offset the same amount to the right hand side of the model?? So what is the reality, probably very little. The magnet in the rear position is a little less helpful on home and small club circuits and the optimum for the average track would be the spot in front of the motor. But, on removing the motor and rear axle and prying free the magnet, it soon becomes obvious that something is wrong. 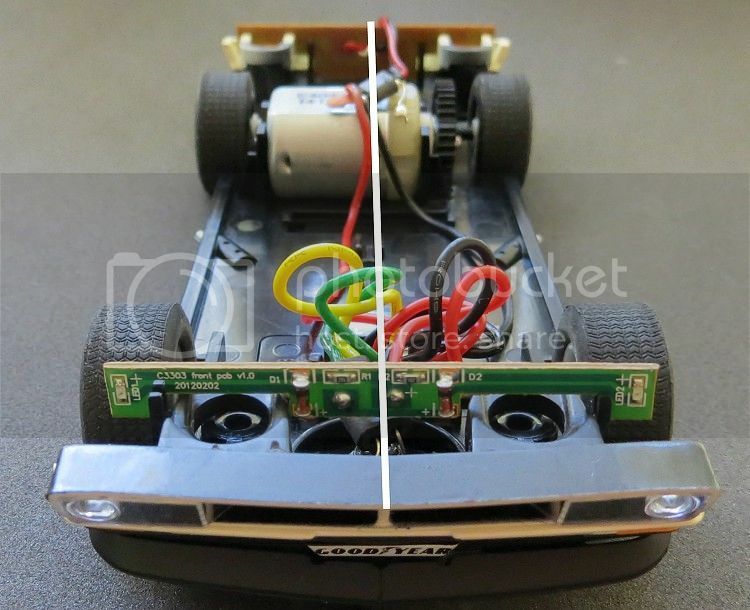 It looks like Mr Scaley has moulded the front magnet position too large, and in doing so, if you fit the thin magnet in the front position, at the slightest provocation it will slip out of the loose mounts and stick itself to the side of the motor time and again. The magnet need to be glued into position if you need it up front. Again not a big deal but I can see that the rear position has been chosen for ease and permanence during factory assembly. The only other quandary is why the rear axle is offset? Once again I would suggest that the rear axle is a millimetre or so too short, and as the right hand wheel is hard up against the axle bush the left finds itself inboard by that millimetre or so. I’m sure the purist will be able to fabricate a new axle in very little time. As for the offset motor, I’m sure very few if any will find it a problem. On the track its size makes the model pretty stable. In a non magnet situation the model is wide enough to be useful straight from the box. Maybe a little more weight to take it up to 100 grams or so for fast tracks and a little bit less for the more technical circuits. On magnetic tracks it might be better to retro fit the 2.6 m.m. thick magnets which seem to be circulating. Rear tyres will need attention and I don’t expect it will be too long before MJK have their version on the market. But until then there will be some heavy sanding needed to get the tyres flat! On Scaley out of the box it is drivable but not competitive even with the Toranas; mainly due to the high position of the magnet. On magnabraid and Carrera it still needs work for it to keep up with the Mustangs and Camaros. But this model is not about performance, Isn’t it about good old Aussie grit and determination! The XB was raced in a few liveries and variations and I’m sure that the loose front and rear panels are specifically like that for a purpose, Mmmmmm? Only the future will tell. But we do still have the 1 and 2 cars and the Brut Falcon potentially to come. The thing is, does Mr Scaley think so too? I took the Falcon to the LCR last night and set about doing some immediate updates and repairs. The first job was to remove the rear axle and true the tyres on the tyre truer. There was a fair amount of rubber came off the tyres and it came off quite easily? The tyre dust was also quite pale (i.e. not black) which leads me to suspect that there is a degree of synthetic material in the compound. The tyres are very soft and gave no trouble hooking up on the Ferrador surface of the LCR, but I also noticed during testing that the model slowed noticeably in corners and after a few exploratory laps I removed the front tyres. Sure enough the tyres were dragging quite heavily requiring extra throttle to overcome it. I put the front axle in the tyre truer and after truing the tyres I took the opportunity of putting several grooves in the tread area. On returning to the track the front end drag had been reduced considerably; but for competition the front tyres will need a more permanent fix. Maybe the 'Wixle' independent front end and some harder front tyres? I have to admit that I couldn't detect any side effects of the lop sided chassis with the magnet in the forward position and it would be my advice not to worry about it too much; the only other mod I would carry out is to fit a wider rear axle, this will get the rear wheels further out under the arches. 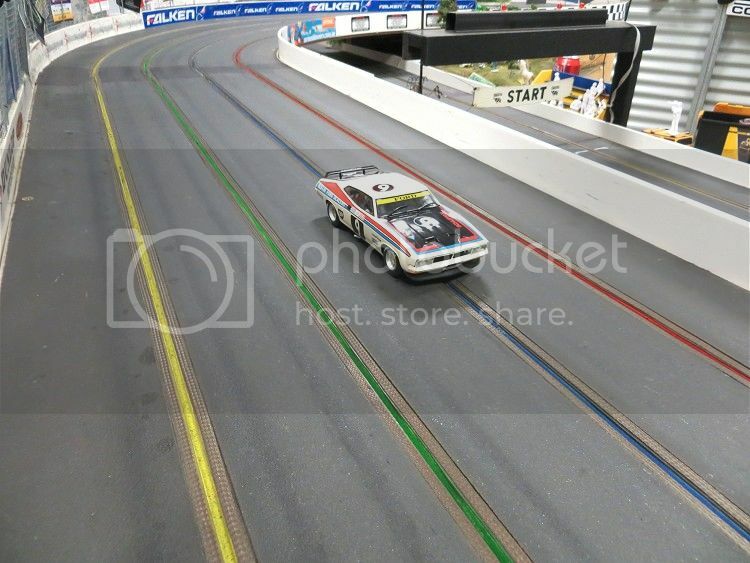 I got to run mine last night for the first time at the Slot Shop .Carrera track only ,When I first drove the car around the track it was like a drift car . I thought Id changed the tyres and taken the magnet out. On inspection I realized I had changed the tyres on my Mustang and not my XB. I searched for some MJKs could only find some other brand .On changing tyres it was a different car . I thought this handles like it has a Magnet in it ,But Id had picked it up and already checked .The second time I checked I realized Id picked it up from the back and I didn't even look at the back magnet position .Bummer the magnets still in it. So I pulled the Magnet out and It went ok but as the tyres were only touching on the edges .I gathered it wasn't going to handle till I had fixed that. It was then I realized that when I first ran the car it was pretty much( out of the box) and that it handled like a dog on a polished floor boards in other words it didn't . I'm sure Scaley don't expect these cars to be run and the WTF effort on the chassis says it all. But I have found a set of MJKs trued them up and changed to better braids so I expect it to go not to bad next time I run it and I may not even need to change to alloy rims. MJK make a tyre for the rear of the XB's what you need is MJK 4275. 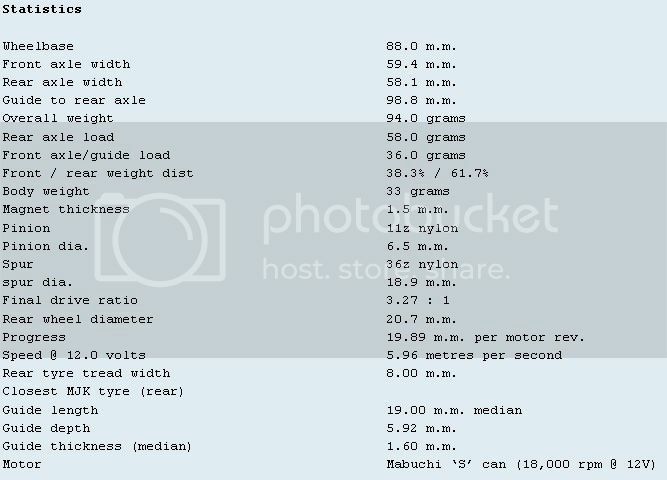 With these tyres and a 2.0 m.m. magnet in the forward position the car should run well. Any one know a Silicon tyre that work on these for a routed track ,Ill be B&%#erd if I cant get it to handle on Silicons ,For some reason we have to run on silicons .I have 15 mm rims on it now ,but I do have a set of 14s if necessary.